Rosy Outlook: My Favorite Recent Purchases! Happy Monday loves! Hope you had a great weekend. We had so much fun in Boston visiting with family and we tried to see as much of the city as we could in such a short time-frame! We walked around Cambridge and got brunch there at Tatte Bakery which was recommended by several people. It was SO adorable and SO good! We walked around the Assembly Square area in Somerville which is full of shops and restaurants and then we also briefly went to Newbury Street which was the cutest but insanely crowded I'm sure partially because the Boston Marathon is today. From what I saw it is such a gorgeous city and we will definitely be returning soon! 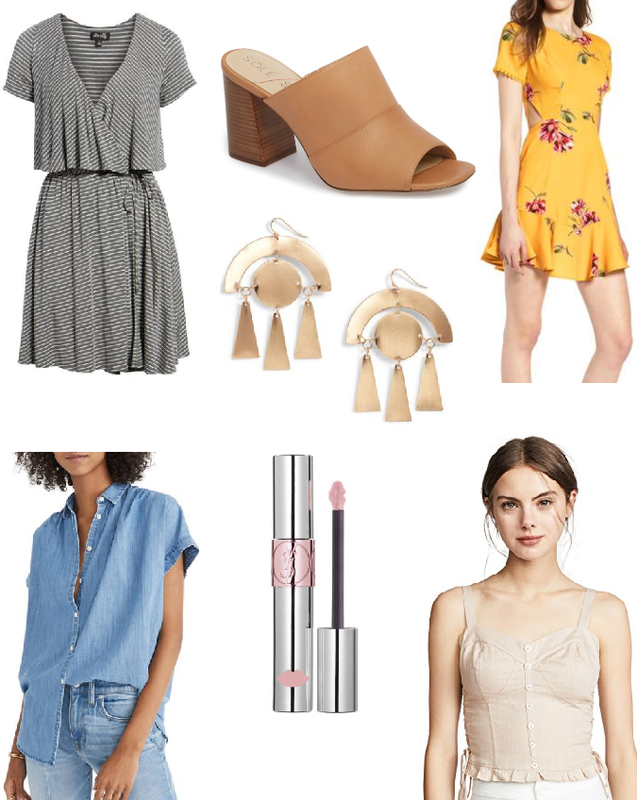 As I've been stocking up for the warmer seasons coming up (HOPEFULLY), I have found so many good items that I wanted to share with y'all! I have been wearing these mules nonstop. They're so comfy and go with every outfit in my wardrobe. I also LOVE this super comfy striped dress. It's can be worn more casual with a pair of sneakers or dressed up with wedges! Love a versatile dress. All of these picks are so cute. I love the earrings. So glad you had a good time in Boston! Come on warm weather, what’s up? Love that dress and those slide sandals so much! What a fun quick trip to Boston! I love your picks. I need that denim top in my life! Love all your latest buys! That dress is so perfect for spring... glad yall had fun in Boston! Glad to hear you had a good time in Boston! It's such a fun city. I love all your recent purchases, especially that denim shirt. I have had my eye on it -- it would be so cute for spring and summer! How nice to get to Boston! I love that dress!! Happy Monday! These are all great picks! I have been eyeing the black flutter dress since I saw it online. How do you like it? I am so glad you had a great time in Boston! I can't wait to go there next month. Any recommendations on places to visit? Lovely picks dear, especially that yellow dress. Such a cute dress, really perfect for spring!